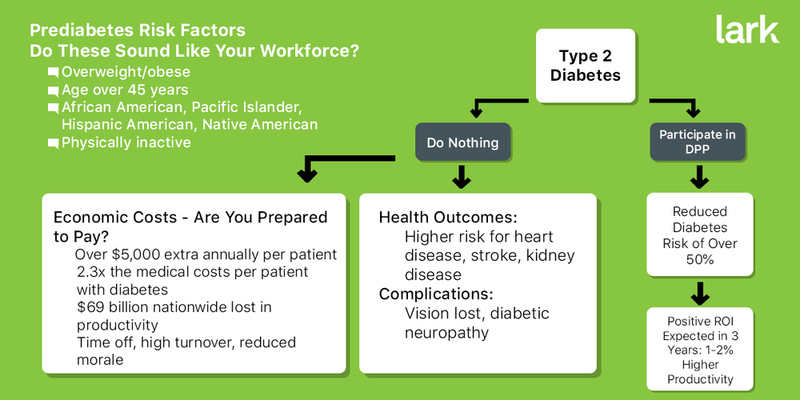 Do you know how much prediabetes and diabetes are costing your organization? These two chronic conditions may be draining more of your finances than you realize, as they are placing a large and increasing burden on workplaces. What you may not also realize, though, is that there is good news. The current environment nationwide is to fight prediabetes and diabetes, and as an employer or insurance provider you can take advantage of programs to improve health and save costs for your workers or patients. The Diabetes Prevention Program (DPP) is a program for individuals with prediabetes and high risk of diabetes. It is a strategy that the Centers for Disease Control and Prevention (CDC) has recognized as an effective way of delaying or preventing type 2 diabetes. Its success has led to opportunities for reimbursement for patients. In addition, offering a DPP can lead to cost savings for your organization within a relatively short amount of time. $7,900: the annual extra cost of medical care for a patient with diabetes. 10%: the proportion of healthcare dollars going straight to diabetes care. $5 billion: cost of excess absenteeism linked to diabetes (up to 7% extra). $20.8 billion: cost of excess presenteeism due to diabetes (up to 38% extra). Human cost aside, your best business move is to keep your employees healthy. For nearly half of your employees, that means targeting blood sugar and prediabetes. How? The National Diabetes Prevention Program (DPP) is one promising answer. The National DPP is a CDC-recognized program designed to lower diabetes risk among patients with prediabetes. It was first tested in a clinical trial that compared the effects of a lifestyle intervention – the DPP – to those of metformin and to a placebo group. The DPP was so successful in lowering diabetes risk that it has been expanded nationwide. There are over 1,800 organizations offering a DPP. Furthermore, the government recognizes its value and is willing to pay. The program can be cost-effective even without external support, as well. Compared to those in the placebo group, those in the lifestyle intervention (DPP) group had a 58% lower incidence of diabetes over the next 2.8 years! In comparison, metformin use led to a 31% lower risk for diabetes. These results are welcome news for everyone. Patients can enjoy better health without drugs or side effects. Providers can offer a treatment plan for prediabetes that does not involve medications. Employers and insurers have a clear way to lower healthcare costs and increase productivity. A CDC-recognized DPP must deliver a year-long curriculum based on the CDC’s materials or similar material. There are 16 modules to cover in the first 6 months, and the second 6 months must include at least 6 more lessons. The main goals are to lose 7% of body weight and achieve 150 minutes per week of physical activity. Lessons are focused on education and on strategies to implement and maintain healthy eating and physical activity. Participants must record their weights at each session. They are also encouraged to log diet and physical activity. Providers can refer patients if they are overweight or obese, are over 18 years old, and have prediabetes or a history of gestational diabetes, without ever having a diabetes diagnosis. Additional participants are welcome to the program if they have risk factors. The DPP is a nationally recognized program, led by certified lifestyle coaches, with dramatic results. That sounds expensive, right? Actually, no! Once you see the figures on cost savings and return on investment (ROI), you might agree that the only question is whether you can afford not to participate! The average per-person cost for participation in the DPP is $500 per year. That amount of money is too much to be taken lightly, but there is justification for it. The program usually breaks even by 3 years or before. The ROI by 3 to 5 years can be $500 to $1,500 or more. Participating in a DPP can do more than improve employees’ health and happiness and make you feel good about your coverage. It can be good for your bottom line, with a positive ROI in a few short years. Some healthcare providers and employers offer the DPP as part of an existing wellness program. You might pay the entire participation fee for your employees or covered individuals, or you might ask them to contribute part or all of the enrollment fee. Because of the program’s overwhelming evidence of success, Medicare has included DPP as a reimbursable benefit since April of 2018. [9, 10] You can apply for reimbursement based on the number of sessions each participant attends. Reimbursement rates are higher when participants hit their weight loss goals. You can choose whether to start your own program or allow your covered employees (and their covered family members) to participate in an existing one. The CDC offers plenty of resources for starting a DPP, but be warned: the standards are tough. To start your own program, you will need to be aware of the CDC Standards and Operating Procedures (DPRP Standards). These are the guidelines, or rules, that you must adhere to to get initial and ongoing CDC recognition. Having a designated diabetes prevention program coordinator. Having at least one trained lifestyle coach. Completing and submitting initial and ongoing paperwork and data. Starting your own program may not be the right choice for your organization if you are not ready to dedicate the personnel, space, and resources to it. You might also have trouble achieving the CDC’s requirements for attendance and outcomes. It can be easier and less expensive to offer employees the option to join an existing program. This lets you avoid the start-up concerns of training staff, finding a location and time to hold meetings, and registering with the CDC. You will not need to worry about data collection or submission as time passes. Is convenient for your employees – they are more likely to benefit if they attend meetings, and more likely to attend meetings that are convenient. Has resources available to facilitate participation. You can look for a DPP offered online or in your area at the CDC’s website, and you might want to search not only by zip code, but also for an online option. A digital DPP, such as Lark DPP, can be your best bet. 24/7 accessibility for participants to be able to get through their DPP lessons or interact with their health coach on other aspects of health, such as stress or sleep. Lack of stigma: Participants can be more honest with their AI health coach without fear of judgement, as they may feel in face-to-face interactions. Responsiveness: Participants receive instant, individualized feedback on aspects such as weight, diet intake, and physical activity. Lark is not just good for employees. It is designed to work for insurers and employers, too! Seamless integration. Health tools, such as a digital scale, are delivered to participants and are designed to work with the app. Support. Lark’s support team has experts ready to get you started and continue supporting your employees through the program. Results. Lark has proven engagement and weight loss results to help your employees stay healthy. Ready for a Diabetes Prevention Program? Prediabetes and type 2 diabetes are among the most expensive and devastating conditions of our time, but there is a way to reduce the burden. Offering your eligible employees and covered individuals the chance to participate in a DPP can be the right human choice, and the right business choice. Get started today!